Loctudy, Brittany was the venue for the 2001 Europa Cup held from 18 to 24 August. Although 2 days sailing were lost due to lack of wind, French hospitality and sunny conditions contributed to a memorable championship for the British, French, German and Swedish competitors. 9 races were scheduled on Olympic courses with the Asymmetric Canoes sharing a common start but doing windward-leeward courses. With legs 1.2 miles long, good eyesight was a prerequisite! The first day's sailing saw perfect conditions -� sunshine and a southwesterly breeze that built l to a force 3. Mark Goodchild, winner of the recent National championship, showed the shape of things to come as he stormed through to take the lead in the first race. 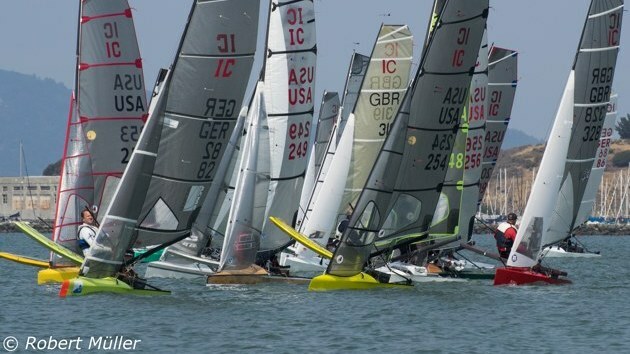 However, the importance of reading the sailing instructions properly became clear, as he finished incorrectly, letting Simon Allen, the defending European champion through to win with John Ellis second and Phil Robin third. A large windshift at the start of the second race led to a one sided beat. Close racing ensued with the lead changing between Mark Goodchild and Phil Robin on several occasions. Robin's superior upwind speed saw him take the gun with John Ellis making a late charge to take second and Goodchild third. There was high-speed action in the Asymmetric fleet, but some confusion as the French sailing instructions indicated 2 laps, but the English version stating 3 laps. All was eventually resolved (the small print indicated that the English version took precedence) to give victory in the first race to Lester Noble (the current World champion who has converted to asymmetric), followed by John Robson and Paul Patrick. The wind shift in race 2 resulted in the downwind leg becoming a tight reach, so no one could carry their spinnaker all the way. There was a close battle between Robson and Noble, with the latter taking the lead on the Hnal lap to win. Patrick again finished third. The second day's sailing saw similar conditions but with a lumpy sea adding to the interest. Mark Goodchild made no mistakes and lead race 3 from start to finish with Simon Allen second, John Ellis third and Olle Bevgquist from Sweden fourth. By the fourth race, the seabreeze had started to compete with and reduce the prevailing breeze. Coupled with an ever strengthening tide and the lumpy sea, this made for trying conditions. The gods were on Mark Goodchild's side. Having made a poor start, he went out to sea and lead at the first mark, overtaking all the boats who had gone towards the shore to escape the tide, a lead he kept to the finish of the shortened race. Allen and Ellis again took second and third places with Peter Lundqvist from Sweden fourth. In the asymmetries Lester Noble took an early lead in the third race only to have a major problem with his spinnaker pole allowing John Robson to take the gun with Phil Allen second. Noble had time to make repairs on shore and won the second race of the day in the dying breeze, comfortably from Paul Patrick. 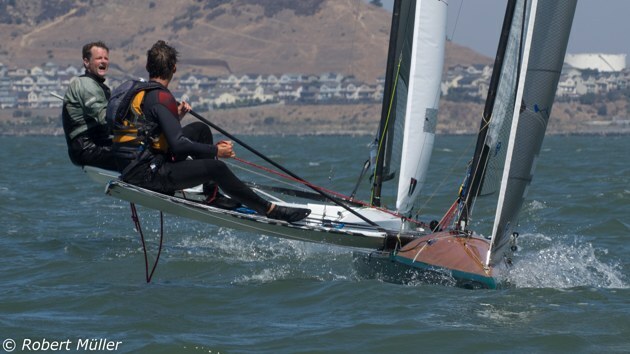 A lack of wind resulted in no racing on the third day. The fourth day saw similar conditions, but after a long postponement, the wind filled in and settled and provided the strongest wind ' of the week. Mark Goodchild blasted into the lead downwind, a position he kept to the finish. Shifty conditions saw local sailor Jean-Luc Perard take second place from Phil Robin in the final moments of the race. 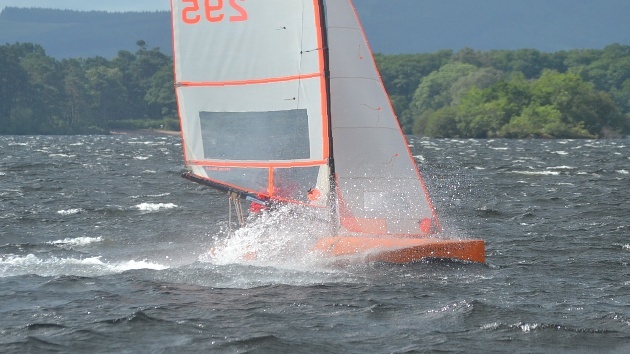 The second race of the day was started at 17.30 hours in a breeze that had reduced to a force 2. John Ellis lead at the first mark, but could not keep ahead of Goodchild on the reaches who went on to record his fourth successive victory, giving him a _ commanding lead in the championship. The Swedes found the conditions to their liking with Johan Elfstrom taking third and Olle Bevgquist fourth. 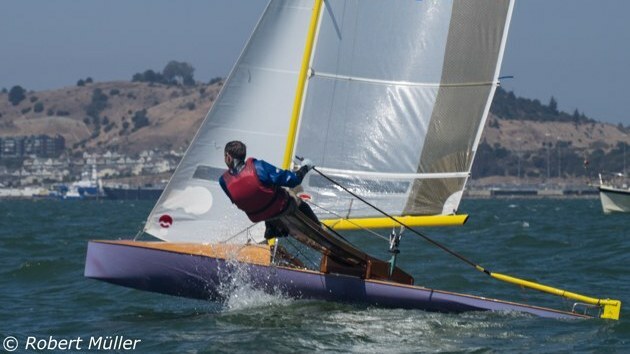 In the asymmetries, Lester Noble continued to dominate, winning both races with John Robson and Paul Patrick each taking a second and third. The final day's sailing was eventually cancelled due to a lack of wind. With 6 races sailed 1 discard was permitted giving the championship to Mark Goodchild with Lester Noble taking the Asymmetric class. For the prize�giving a stage and podium was set up - all that was missing was the champagne and Murray Walker's commentary! Having won both the National and European championships, the next goal for Goodchild is the World championship. 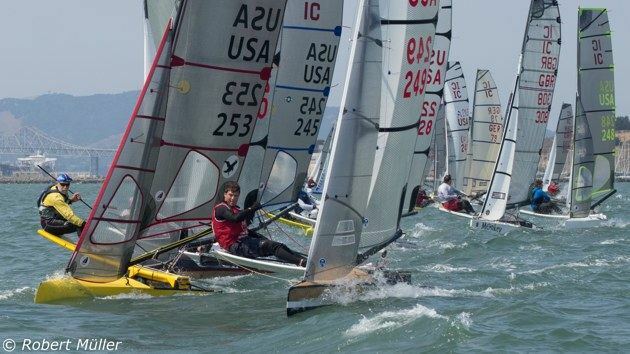 Sailed every three years, the next event takes place in Rhode Island in August 2002. 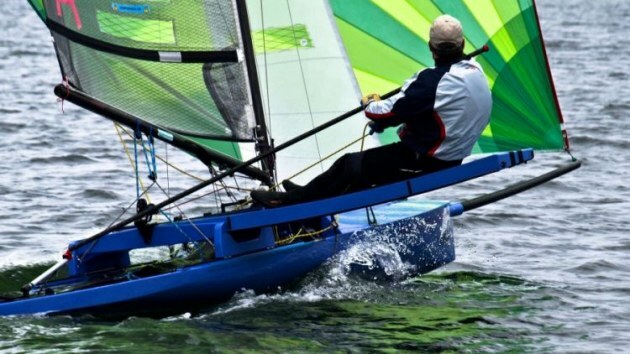 All the leading Canoes are now built in �carbon fibre, with the Razorback and Ellis boats showing identical speed. The greatest difference is in the rigs, with carbon fibre masts from Angell, Claridge and Superspar and sails from Morrison and Orange dominating. Aluminium masts are rarely sighted these days � how things change!